I think it’s fair to say that many of us miss out on experiencing a lot of great destinations simply because they are on our doorstep. We either put off visiting today with the excuse that we can visit any time (though never do), or don’t even consider local attractions purely because they are so close to home. But I think it’s well worth making the most of what’s nearby – after all, somewhere doesn’t need to be far away to be amazing. Pretty hard to miss if you’re heading to Newcastle by road, the Angel of the North is one of Britain’s most famous sculptures. 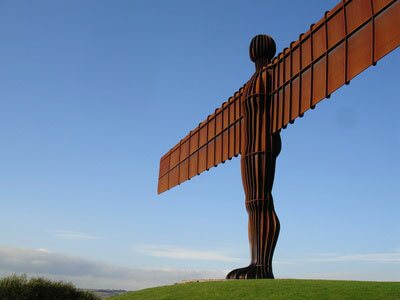 Standing over the A1, the angel is 20 m high, has a wingspan of 54 m and is made from 200 tonnes of steel. Even if you’re not planning on driving, make sure you take a trip to stand in the angel’s shadow. Once you arrive in Newcastle, you should make a beeline for the Castle Keep, which stands in the centre of the city. This Grade I listed building is worth visiting for several reasons, not least of which is that from the top you can get amazing views over the city. The second is that it stands on the site of a Norman castle, which is where the city actually got its name from. So, it’s a very apt place to begin your 48 hours in Newcastle! Grey Street, Grainger Street and Grainger Market make up Grainger Town – a historic part of the city and one of the best places to go for a spot of shopping. So, it’s a good place to kill two birds with one stone! As you amble around the streets, you’ll be able to admire a lot of classical architecture, most of which was built in the 1830s. And while you do so, you can pop into some of the city’s best shops; the nice thing about indulging in a little retail therapy in this part of the city is that there’s a great mix of independent boutiques and designer brands. Newcastle is a really culturally rich city, so you should squeeze a visit to one of the local galleries into your stay. The BALTIC Centre for Contemporary Art is particularly worth a visit. Located on Gateshead Quays, it is the largest gallery of its kind in the world. Unlike most galleries, the BALTIC Centre is made up of temporary exhibitions rather than permanent collections, and showcases a mixture of local and international art. You can’t go to Newcastle and pass up the opportunity to spend a night on the town, especially since there’s such a wide variety of places to go to that it’s pretty hard not to find somewhere you like. It’s particularly good for cocktail bars, with Tokyo on Westgate Road being among the best. Filled with Japanese-style decor, it is an ultra-classy venue that serves up everything from classic cocktails to its own concoctions. To experience a very different scene, you could head to the Hyena Comedy Cafe, which also serves some great food. Come here on a Thursday, Friday or Saturday for some big laughs and fab flavours.